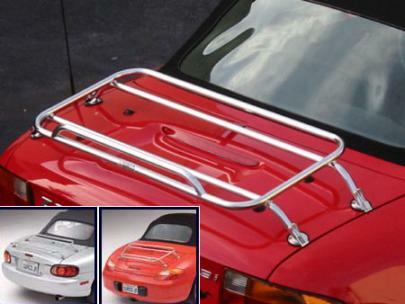 We carry only the best stainless steel removable trunk racks. Made entirely in the U.S. from quality materials and outstanding workmanship. If you don't see what you are looking for give us a call at our toll-free number. Available for: BMW Z3, BMW Z4 (E85 2003-2008), Miata, Boxster, Honda S2000, MG 63-80, Ford TBird (2002-2005) add $30, and Mercedes SLK (R170). Easy to install and remove stainless steel trunk rack. No drilling required. Trunk racks available for these vehicle, Select correct model on checkout. This is an oversized U.S. Domestic shipment, $25.00 is added to the normal S/H charges.